The perennial three yellow-petaled hawkweed is also referred to as the meadow hawkweed complex. Roots are shallow and are made up of runners that can create mats of vegetation. Rosettes contain narrow, spatula shapped leaves that are up to six inches long and dark green on the top of the leaf and lighter green underneath. A rosette will produce ten to thirty flowering stems that usually grow up to two feet in height. The stems are covered with stiff, short hairs and very few leaves. As with orange hawkweed, this plant, when broken or damaged will produce a milky latex. 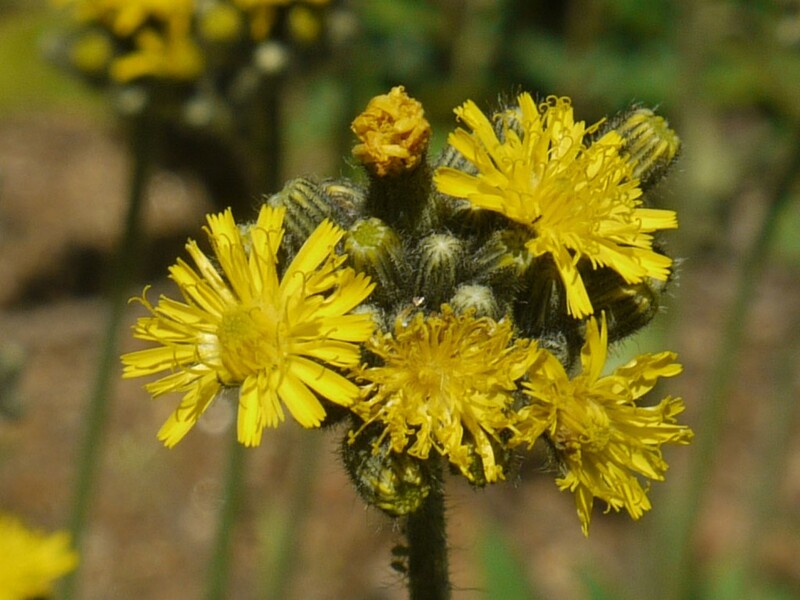 The flowers can be bright yellow to whiteish yellow, are ½ inch to one inch in diameter, have ray petals with square tips, and resemble dandelions. Flowers bloom from June to August. Flower heads are arranged in a flat-topped cluster, and seeds are small, black and have a tuft of bristles on the flattened end. Root runners and seed production make the hawkweeds extremely invasive and hard to manage. Meadow hawkweed prefers soils that are well drained and gravelly. This plant grows in moist mountain meadows, clearings in forests, pastures, hayfields, cleared timber units, roadsides, abandoned farmland, and disturbed sites.